FREE delivery to United Kingdom in 10 - 15 working days. 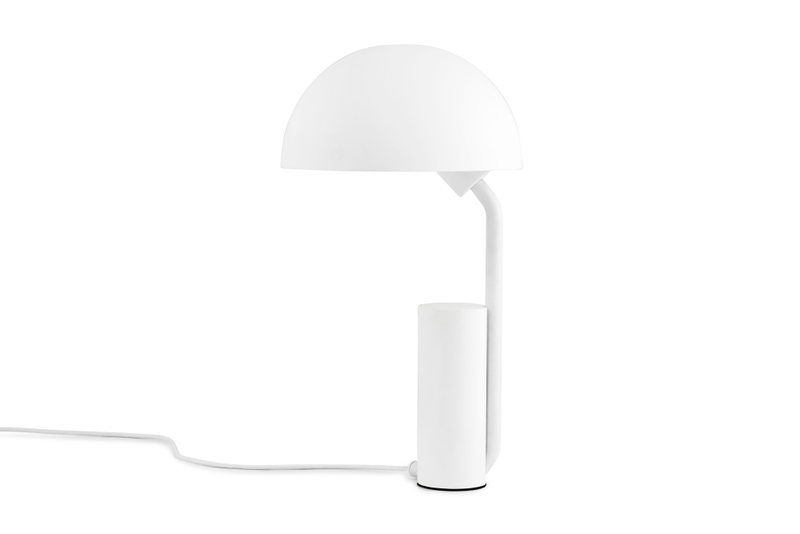 Cap is a functional table lamp with an adjustable shade. The design is playful with lots of personality. Cap consists of a mix of iconic, geometric shapes such as circles and cylinders. This gives the lamp a streamlined look, while the sloping pole that holds the socket and shade makes the expression welcoming and relaxed. The white inner side of the shade reflects the light, while the rotatable shade makes it possible to direct the light in any way you want to. This makes it functional both as a reading lamp, for spreading a lot of light and for creating a cozy lighting atmosphere. The Cap offers a palette of fashionable colour tones that can complement your existing decor and can serve as an eye-catcher in a neutrally styled room. The lamp is delivered with a globe bulb and a 2 m textile cord with switch. Clean with damp cloth. The German design studio KaschKasch was founded by Florian Kallus and Sebastian Schneider in 2011. With a main focus on precise lines, geometric shapes and well thought out details, KaschKasch creates straightforward contemporary designs with a graphical expression. The young design team has already received critical acclaim for their work and has been nominated as “Best Newcomers” at the highly esteemed German Design Award.